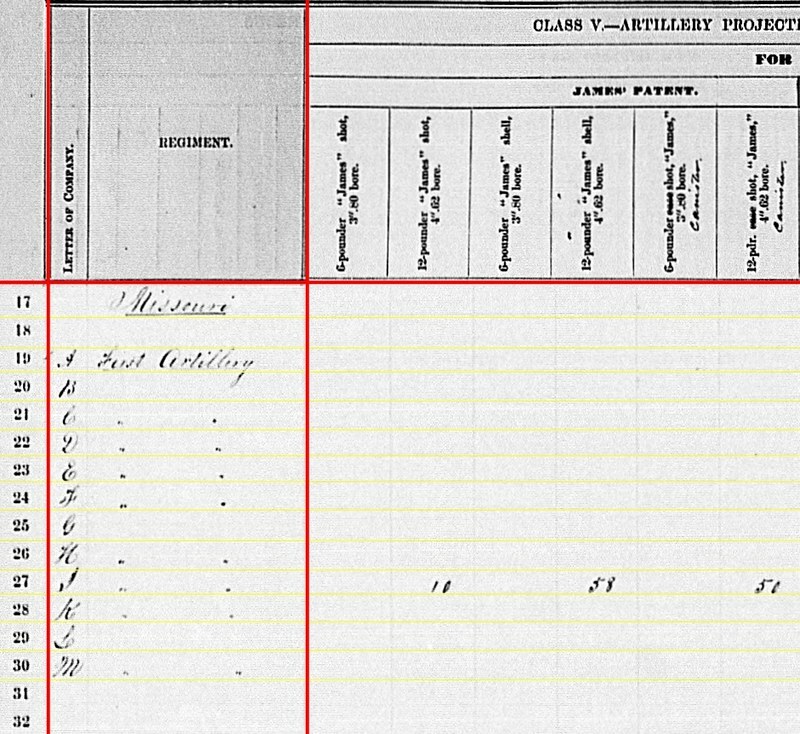 The summary of returns for the 1st Missouri Light Artillery covering the third quarter of 1863 are interesting due to the appearance of out-of-the-ordinary artillery pieces. 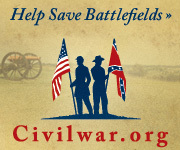 Likewise, the summary of their service during the quarter is of interest due to many of the lesser known Civil War campaigns that must be mentioned. Colonel Warren L. Lothrop commanded the regiment. But as field grade artillerists were in short supply in the west, Lothrop pulled duty as the Chief of Artillery for the Sixteenth Corps, in Memphis, during the summer and fall of 1863. Battery A: Reported from Carrolton, Louisiana with two 6-pdr field guns, one 12-pdr Napoleon and three 12-pdr field howitzers. Captain George W. Schofield remained in command. However, Schofield took a well deserved leave in October (and was due for a promotion). In his absence, Lieutenant Elisha Cole lead the battery. After the fall of Vicksburg, the battery moved with Thirteenth Corps to New Orleans. There it was on duty around New Orleans until October. Battery B: No return. 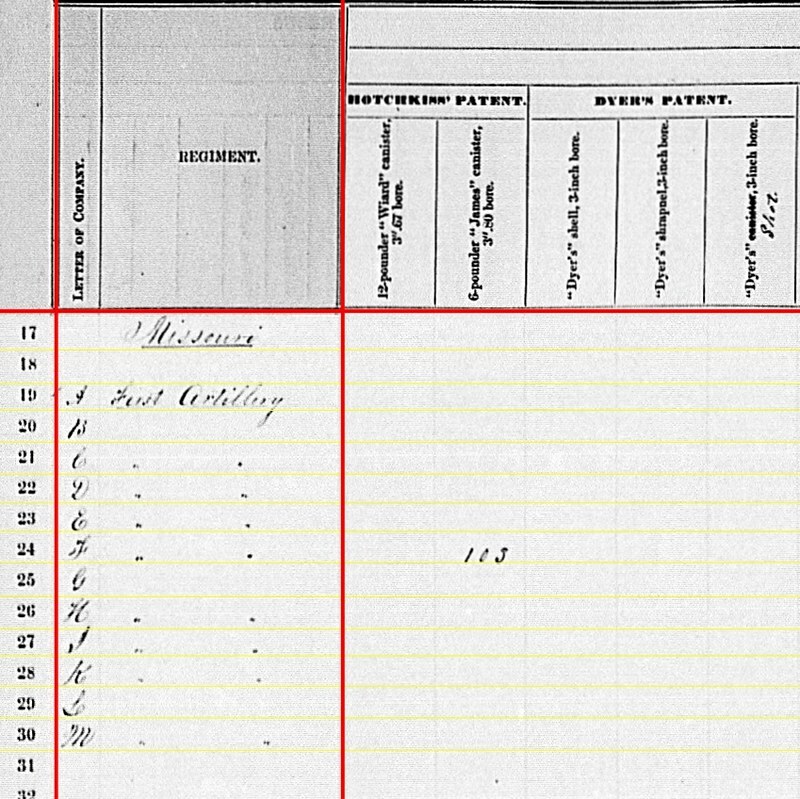 Also assigned to the Thirteenth Corps, this battery was also in New Orleans at the end of September. Captain Martin Welfley’s battery remained with Second Division of the corps. Welfley had reported two 12-pdr field guns and four 12-pdr field howitzers earlier in the previous winter. Records are not clear if those were still on hand as of September 1863 or those had been exchanged. Battery C: Reporting from Vicksburg, Mississippi with four (up from two) 12-pdr field howitzers (having turned in two 6-pdr field guns). Captain Charles Mann remained in command, with the battery assigned to Sixth Division (later re-designated First), Seventeenth Corps. Mann would be promoted to Major at the start of November. Captain John L. Matthaei was appointed to replace him. Battery D: At Corinth, Mississippi, with three 6-pdr field guns (up from two the previous quarter), two 12-pdr field howitzers, one 24-pdr field howitzer (an addition this quarter) and two 3-inch rifles. The battery, under Captain Henry Richardson was assigned to Corinth, part of the Sixteenth Corps. However, at the start of October the battery transferred to Fourth Division, Fifteenth Corps and sent to Chattanooga. At that time, Richardson was the division artillery chief, with Lieutenant Byron M. Callender leading the battery. 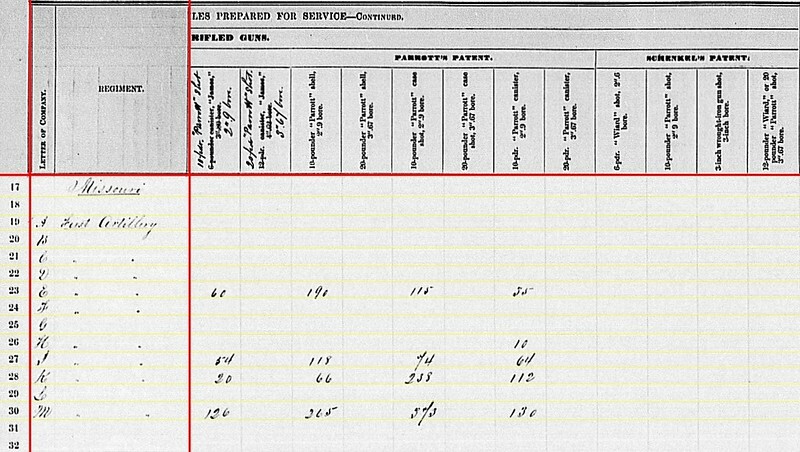 Battery E: Reporting at Brownsville, Texas with four 10-pdr Parrotts and two “Rebel Trophies English 3.5.” Yet another designation change for the same weapons. These were “Fawcett Rifled Iron Gun, Cal. 3.5.” in the second quarter. After Vicksburg, Captain Nelson Cole’s battery was assigned to Second Division, Thirteenth Corps and sent to New Orleans. As of August 10, Cole was promoted to Major and assigned staff duties in Missouri (and later to command of the 2nd Missouri Artillery). Lieutenant Joseph B. Atwater took his place in command of the battery. In September the battery was involved with operations on the Atchafalaya River. The Brownsville location, however, is relative to the reporting date of January 1864. Battery F: On Mustang Island, Texas with two 3.80-inch James Rifles and four 3.5-inch Fawcett Guns. The location reflects a reporting date of September 1863. Captain Joseph Foust remained in command, and the battery assigned to Second Division, Thirteenth Corps. As of the end of September, the battery was at Carrolton, Louisiana. The Texas location is from the December reporting date (and a story for the next quarter). Battery G: No return. Captain Henry Hescock’s battery was assigned to the Third Division, Twentieth Corps. Hescock was also listed as commander of the artillery brigade supporting the division. That left Lieutenant Gustavus Schueler to lead the battery. The battery brought four 12-pdr Napoleons and two 10-pdr Parrotts to Chickamauga, seeing action on September 20. The battery fired 277 rounds in the battle. And Hescock was captured (and would remain a prisoner until the end of the war). Battery H: At Corinth, Mississippi now rearmed with six 12-pdr Napoleons. Captain Frederick Welker’s battery was part of the garrison at Corinth, under the Sixteenth Corps. Battery I: Reporting at Pocahontas, Tennessee (a railroad stop northwest of Corinth), with two 6-pdr field guns, one 12-pdr field howitzers, two 10-pdr Parrotts, and one 4.62-inch rifle (likely a 12-pdr “heavy” field gun, rifled using the James system). Captain Benjamin Tannrath commanded the battery, assigned to the Sixteenth Corps, under the Corinth Garrison. Battery K: At Little Rock, Arkansas with four 10-pdr Parrotts. Captain Stillman O. Fish was in command. The battery was part of the District of Eastern Arkansas. Battery L: No return. Captain Frank Backof’s Battery remained at Rolla, likely with two 12-pdr field howitzers and four 3.67-inch rifles. At the end of September, Backof was busy recruiting. In October he was promoted to Major in the 2nd Missouri Artillery. Captain Junius G. Wilson McMurray transferred from Battery M to command in the interim. Battery M: At Vicksburg, Mississippi with four 10-pdr Parrotts. This battery remained assigned to Seventh (later First) Division, Seventeenth Corps. In McMurray’s place, Lieutenant John H. Tiemeyer had command of the battery. The First Missouri Artillery was thus spread across the Mississippi River Valley doing good work. And they had perhaps the widest array of cannon for any artillery regiment at this time of the war. We turn then to the ammunition, starting with the smoothbore. Battery A: 390 shot, 343 case, and 85 canister for 6-pdr field guns; 90 shot, 71 shell, 144 case, and 40 canister for 12-pdr Napoleons; and 410 shell, 565 case, and 114 canister for 12-pdr field howitzers. Battery C: 220 shell, 220 case, and 130 canister for 12-pdr field howitzers. Battery D: 191 shot, 140 case, and 159 canister for 6-pdr field guns; 119 shell, 162 case, and 38 canister for 12-pdr field howitzers; and 39 shell, 24 case, and 24 canister for 24-pdr field howitzers. Battery H: 288 shot, 96 shell, 288 case, and 96 canister for 12-pdr Napoleons; plus 53 case for 24-pdr field howitzers (which the battery had on hand the previous quarter). Battery I: 43 shot, 223 case, and 109 canister for 6-pdr field guns; 69 shell, 46 case, and 70 canister for 12-pdr field howitzers. 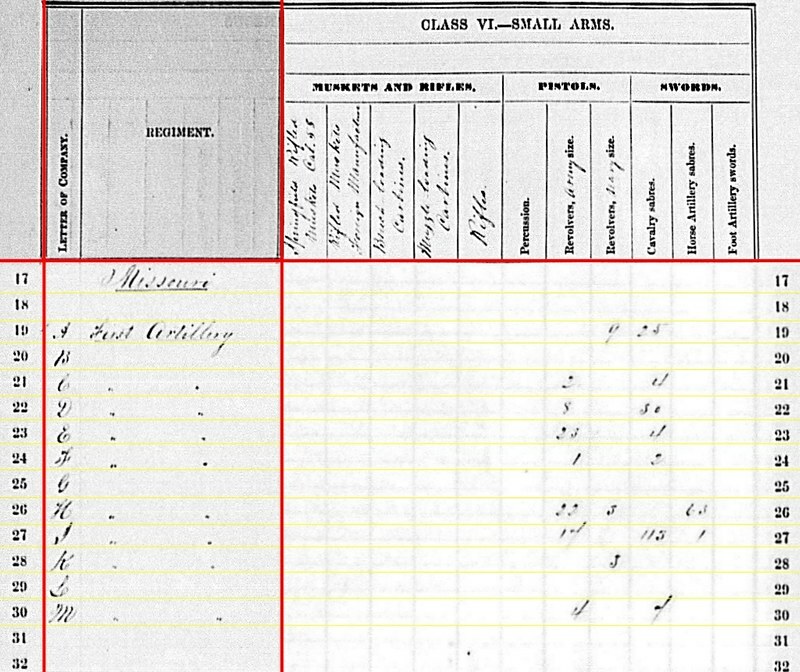 In addition to those batteries reported here, in his report from the battle of Chickamauga Schueler recorded firing 26 shot, 86 shell, 94 case, and 9 canister. An interesting mix of ammunition fired. In action the battery was under fire mostly from infantry. They suffered four casualties to musketry. Something to think about with this being a “close” action. Battery D: 40 canister, 98 percussion shell, and 146 fuse shell for 3-inch rifles. Battery F: 29 shot, 224 percussion shell, and 45 fuse shell for 3.80-inch rifles. Battery F: 103 canister for 3.80-inch rifles. Battery I: 10 shot, 58 shell, and 50 canister for 4.62-inch or 12-pdr James rifles. Battery E: 60 shot, 190 shell, 115 case, and 35 canister for 10-pdr Parrotts. Battery H: 10 canister for 10-pdr Parrotts (left over from the previous quarter). Battery I: 54 shot, 118 shell, 74 case, and 64 canister for 10-pdr Parrotts. Battery K: 20 shot, 66 shell, 238 case, and 112 canister for 10-pdr Parrotts. Battery M: 126 shot, 265 shell, 373 case, and 130 canister for 10-pdr Parrotts. Of note, Schueler reported Battery G fired 5 case and 57 shell from 10-pdr Parrotts at Chickamuaga. Battery A: Nine Navy revolvers and twenty-five cavalry sabers. Battery C: Two Army revolvers and four cavalry sabers. Battery D: Eight Army revolvers and thirty cavalry sabers. Battery E: Twenty-three Army revolvers and four cavalry sabers. Battery F: One Army revolver and two cavalry sabers. Battery H: Twenty-two Army revolvers, three Navy revolvers, and sixty-three horse artillery sabers. Battery I: Seventeen Army revolvers, 113 cavalry sabers, and one horse artillery saber. Battery M: Four Army revolvers and seven cavalry sabers. Aside from the three batteries not reporting, the important missing piece here is the ammunition for the 3.5-inch English rifles. There is a paperwork trail showing contracts for production of 3.5-inch rounds. And we can assume the Missourians didn’t haul those down to Texas without carrying a few chests full of those. But as far as the returns are concerned, the clerks at the Ordnance Department had no columns for to track those. Say it together – Bureaucracy!